Have been using Nissin Pro Spec 320 for fishing stocked streams in Virginia during the spring and summer. Learned Tenkara by following Chris on TenkaraBum.com and Youtube videos; got my graduation when I caught 4 rainbows in 15 mins out of a pool where a bait/spin fisherman was trying to fish for the past 1 hr. He came over and demanded that I was using something illegal; allowed him to inspect my rod and flies (used the Anthony Naples Brown Hackle Peacock). He wasn't too happy and his buddy who had heard of Tenkara insisted that Tenakara fishing was illegal in Virginia. Had to finally drive down to the nearest ranger station (was fishing in a national forest) and let him decide; ranger had never heard of Tenkara but said that all fishing gear was allowed and there was nothing illegal in the way I was fishing. 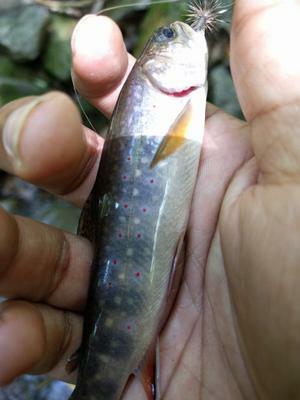 Have been itching to go out again and couldn't wait for the fall stocking; decided to go for brook trout fishing in Shenandoah. It was amazing and don't know why I neglected them, they fight harder, not a soul around just you the stream and nature. Used dry flies this time and it was a blast watching the fish attack them as soon as they land. 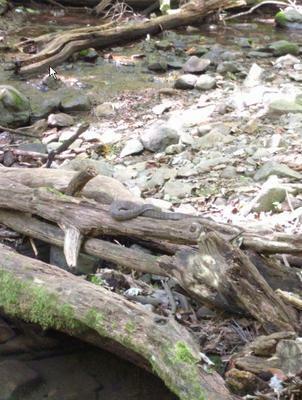 Cant wait to go hiking again and find a new stream in the mountains! Thanks Chris for the amazing info on the website and helping others get into Tenkara! Nice report. You were too accommodating. I would have told those dudes to go fetch the ranger, and then kept on fishing! It's interesting how people in the east react differently than people out west. Everyone I've come across in western states are interested in Tenkara and not accusatory that something illegal is occurring. Maybe it has to do with fishing pressured areas in the east. You handled it well. I would have used a certain 4 letter word followed by "off" with them. What happened to their tails? Yes it was definitely because of pressure; once the stocking is online its a frenzy to get on the stream. Accommodated them because I had no choice as it became a crowd of 6 and it was no longer fun to fish with all the arguments. Heading to Glacier on Sept; will practice casting on my bigger rod which I havent been able to use yet(Daiwa Kiyose) hopefully will land a few fish. I think its unrealistic to characterize how one half of the country reacts to fixed line fishing methods based on this one experience. Many of you have become aware of these methods from this site based out of New York City. There sure are a lot of us in the east whether you consider that to be the mid-line of the country, east of the Mississippi, or just east of the Hudson and we are not of one mind, one opinion, or one attitude. Hi John: Looks like a case of jealousy. Having been stationed in northern VA while in the Army and frequent visits since then to visit the family of my war bride(Fairfax Co.) and fish. I've seen the stocking first hand. The bridges looked like porcupines from all the rods and poles sticking out from then. The horror! 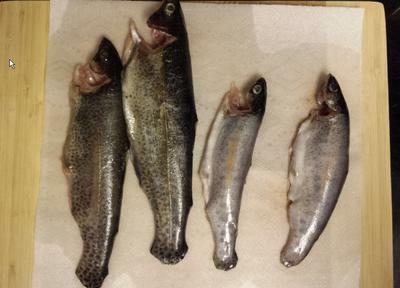 Stocking legal-size trout and announcing the dates is a recipe for bad behavior. People who only fish right after the stockings never really learn to fish; they're just after meat. So how dare you catch "their" trout so successfully? Bet it doesn't occur to them to look into tenkara or even regular fly fishing....or how to just plain fish with any tackle. Thanks to Trout Unlimited, Michigan has long stocked trout smaller than the legal keeper size and does not announce the stocking dates. By the time the trout reach legal size they're acclimated and feeding naturally. Skill is needed to catch 'em. When we go back to the Old Dominion I only fish for trout in Shenandoah National Park. As you found out it's not crowded by any means and the scenery is gorgeous! Please limit your kill, don't kill your limit. And consider catch and release. Good luck in Glacier National Park! We've been out there many times. Another absolutely beautiful place. Back from our little mini camping vacation in Glacier; didn't get much time on the water as we spent most of our time hiking and it was snowing :)! But caught 18in Rainbow and 15in brown (1st day) on the brown hackle peacock (its become my one fly and Daiwa Kiyose 43M my one rod). Don't have any pics of them as I didn't have my cellphone with me (released both fish). Went back next day but didn't get any hits; beautiful place to fish tenkara quiet and peaceful. Krueger: didn't make any assumption about how any part of the country reacts to Tenkara. Most want to know what it is as they haven't seen anyone fishing with a really long rod and no reel. Have made many friends and interesting conversations fishing here. Shared my experience in stocked streams and that was the only one negative exp so far. Herb: Yes usually do catch and release but some stock streams I do keep. Yes Shenandoah is definitely more beautiful and peaceful. Haven't run into anyone fishing tenkara so far yet.